That's it for me for 2009, folks. I will be packing and cleaning and moving and unpacking and...until the new year, so no bloggedy-blog next week. Let's recap what's happened in 2009, shall we? First, you can buy Ghost Notes, Songs from Memory or Stuck Outside of Phoenix at my website for only $5 between now and the end of the year. 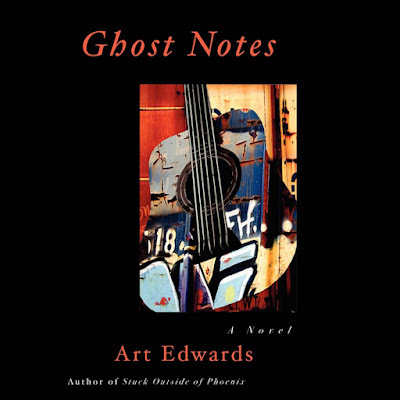 Second, you can download Ghost Notes the unabridged audio book here. Finally, you can buy both Ghost Notes and Stuck Outside of Phoenix for your Kindle device. Thanks for keeping up with me in 2009, and we'll see see you again in 2010! Until the end of the year, you can buy Ghost Notes, Songs from Memory or Stuck Outside of Phoenix at my website for only $5! On Friday, Kel and I picked up the keys to our new home. It's in Milwaukie, Oregon, just southeast of Portland, and it's the first home we've purchased since April 22, 1998, when we bought one in Phoenix, Arizona, back in the days I played in the Refreshments. Actually, I played in the Refreshments for only a couple of more weeks after that date. On April 23rd, the band called a meeting where it was decided everyone would take three months off to think about what they wanted from their future in the Refreshments, or if they wanted a future in the Refreshments. We played one last gig at Hayden Square in Tempe, and a couple of weeks later I decided I'd had enough of life in the Refreshments. So, there Kel and I were, with a new house in Phoenix and no idea how to pay for it. After some soul-searching, we decided to move to San Francisco, where I would go to school and she would work in publishing. We'd rent out the Phoenix house, enlist a friend as a property manager, and hopefully wouldn't have trouble finding good tenants and keeping up with the mortgage. In San Francisco, from 1999-2002, Kel and I worked and went to school at night. We had a couple of tenants at the house in Phoenix--one good, one not-so-good--and made it to 2003 without having to reach into our own pockets to pay the mortgage. Renting that house worked out well enough us, but it caused a lot of anxiety. What if the tenants tore the place up, or didn't pay? Worse, what if it sat dormant for months at a time? There was a lot of shoulder shrugging and leaving things to fate. In 2003, we moved from San Francisco to Ashland, Oregon, where I wrote and Kel worked to become the independent artist she is today. When our second tenant backed out of the Phoenix house, we decided it was time to sell, and we sold quickly for a modest profit. We worked diligently for three years, and in late 2006, we decided we were ready to buy in Portland, where we'd always dreamed of living. We got a realtor, a list of properties, and headed to the city ready to make a deal. We quickly found our expectations dashed when property was way too expensive for our budget, and no one wanted to haggle. We bid on one place, which was in a town we really didn't want to live in, over an hour from downtown Portland, and quickly realized our plan was going nowhere. Home prices were too high for us, and everyone was enjoying seeing their homes double in value. We were left out. So we went back to Ashland, wondering what to do next. It took a year, but eventually we decided to move to Chicago. Drastic? Probably. We had family close by in Illinois, much of Kel's work was in the central time zone, and, we figured, property had to be cheaper in the Midwest. We packed up a moving truck with all of our things and drove across the country in December, hoping to rent for a year and perhaps buy if all went well. All didn't go well. The move didn't really help either of our careers, and in general property was no cheaper in Chicago than in Portland. I love Chicago, as anybody who's ever watched me watch a Cubs game knows, but it's an expensive town, and the winters aren't worth the expense for us. After a year, we packed up another moving truck and drove again across the frozen tundra to get back to Portland, the place our hearts had never left. In Portland, we waited until May and started once again looking for a home to buy. The climate had changed dramatically with the Great Recession and the bursting of the real estate bubble, so we hoped some of that would work in our favor. We looked at houses all summer and fall. We bid on nine total--short sales and foreclosures and all the rest--trying to stay within the budget we'd set for ourselves three years previously. We had every experience in the book, from getting outbid, to owners raising the asking price of the home after we bid, to banks raising the asking price of the home after we bid, to banks removing the home from the market in the middle of the bidding process. Very stressful. No fun. I almost had to write a letter. Finally, we came to an agreement with the seller of a house in Milwaukie. We had a miniscule 12 days to close, but the hoops were jumped through without too much trouble, and we now have the keys in our hands. The house is over 2,000 square feet, plenty big for both a home and home-studio, 20 minutes from downtown Portland, and we stayed within our budget to get it. We couldn't be happier with our decision. For those of you who have been in the housing market for a long time, take heart. There were many times in the last few years when we doubted the system, and wondered if we would ever close a deal. Prices are still coming down, and could continue to do so. It worked out for us, and it can for you, too. Now, we get to pack and move again. Hooray! A few of you have caught on that, because of the free shipping kicking in at $20, buying the three-pack and adding one more item gets that extra item for free. In other words, if you order a three-pack, choose one more item and give it away for Xmas! So, I'm reading the manuscript of my novel-in-progress, which is called Good Night to the Rock 'n' Roll Era. At this stage, it's hard for me to see what's good about it--only what's missing--but after three years and maybe four drafts, I can safely say I'll have something that one day will trump Ghost Notes and Stuck Outside of Phoenix both. It's the sequel to Ghost Notes, but it deviates greatly from my previous two books. 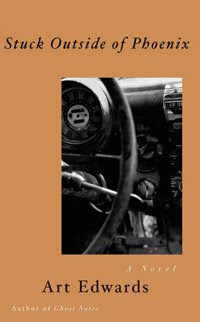 There's really only one character who makes the jump from Ghost Notes to the new novel, Betty, and the new novel takes on a great deal of new terrain, from a band's inception to the making of a record to a country-spanning three-month tour. One of the things I really want to do in the next revision is expand on some of the locales of the tour, making each city rich and authentic and itself. If you have a novel that takes place in a dozen or two...or three...cities, you'd better make sure each place is distinct. One little thing wrong in any one of them and don't worry, someone will let you know about it. You'd want to strangle the Coen Brothers for not giving you more, wouldn't you? I don't want to get strangled, so the bit players come back. I promise to write more on this novel in the coming weeks and months.